For those who didn’t know, Apple has just released its Mac Pro to the world. The Mac Pro is cylindrical and small but it might be one of the most powerful desktop computers on the market. It will go from a price range of $3.000 and can go all the way up to $10.000. You can completely customize it to have up to 12-core Intel Xeon E5 processor, 64GB of RAM and 2 AMD D700 GPU’s. But what is even cooler is that it is one of the very few desktops that support 4K resolution screens and the Mac Pro can support up to 3. Since Apple doesn’t offer any 4K resolution display, we thought we’d put together a list of the best 4K displays available organized by size. We have selected different monitors depending on their screen size, we have Small (from 21″ to 24″) medium (27″ to 31″) and Large (31″ and above). Ahh so you are looking for a 4K monitor between 21inch and 24inch? We found that the best 4K monitor in this size range is the Dell Ultrasharp UP2414Q a $1.299 24″ monitor. The monitor includes a flexible stand allowing you to adjust the high and tilt of the display, with over 1 billion colors, 185PPI and 8MS response time this display is great for Video editing and picture editing. In the 27″ to 31″ size range there is more choice then from the 24″ and we came to the conclusion that the best 4K monitor from “Medium Size” is the Asus PQ321Q a 31″ monitor. If you thought 4K monitors were going to be cheap you were wrong, it comes at a pricey $3.000. The PQ321Q features 2 HDMI ports, 140PPI and 8MS response time. Ah, so you think you can handle bigger then 31″? 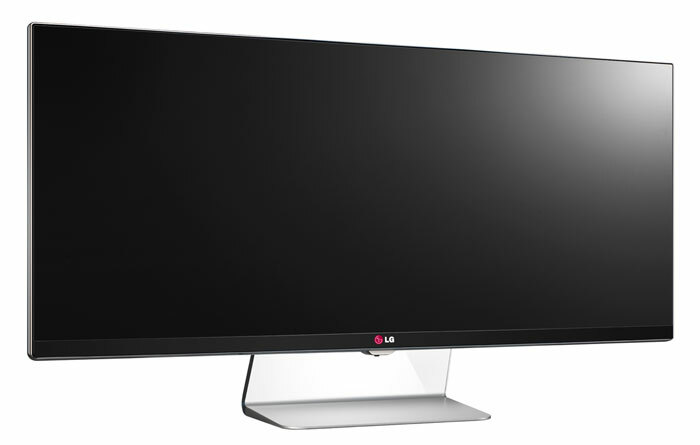 i hope your wallet and patients is just as big as your love for big screens because the bigger the more expensive and unfortunately there aren’t any more good 31″ or bigger monitors we can recommend but we thought was definitely worth mentioning is the LG UM95 series 31″ widescreen 4K monitor. a 21:9 widescreen display (making it look muuuch bigger then it actually is, the image above is not a prototype, its the actual monitor) that has “true 4K” which means it has a 4,096 x 2,160 resolution. The cool thing is it will also have a Thunderbolt 2 20GB port so you won’t have to make use of HDMI. As of now we don’t know a price but we expect it to be around the $4.000, you can also go for the UM65 which will come with less HDMI ports but also at a cheaper price. The bad thing? It will be revealed in January at CES so it will take a couple of months for it to become available. Why is there no Thunderbolt 2 Display yet? As of now Apple hasn’t confirmed anything on a new possible Thunderbolt display but we have spotted several signs that could mean Apple is working on one, we covered them in this article and they detail to a possible 27″ and 31″ 4K display.